And who better to show the First Family firsthand healthy tips than the picture of health himself, Guy Fieri. Somebody guard the White House garden. That's right. Apparently Mr. Ferraririwoierou will head to Washington next month to cook for the Obamas. Apparently not wanting (or allowed) to cash in, Food Network will not be taping the event for television. This is apparently going to be an intimate affair. I hope Guy chooses his fanciest sunglasses to hang on the back of his head for such an occasion! So what will the 'Big Bite' himself cook for Mr. and Mrs. O? "It'll be a little Italian and something creative -- a BLT sandwich made with duck," Guy told the National Ledger. Just another photo op for Obama who loves having his picture taken. MAybe Fee-eddi can make em ribs and fried chicken. 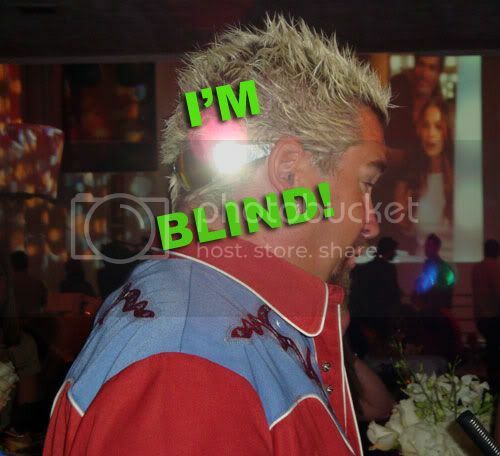 Guy Fieri is about the only show on FN that I click off at the beginning. I have to wonder how America-Hating Michelle chose him to do the cooking... the Neelys weren't good enough? Well duh...when I think of healthy I of course think of Guy Fieri! Next the Obamas will hire Paula Deen as a dietitian. That's like hiring Rip Torn to teach kids about the dangers of drinking. Wow - was Big Daddy and the Neeley's unavailable? Perhaps their style of cooking doesn't match up with the Obama's palates. Gina Neely and Aaron McCargo couldn't pass the basic security check required by the Secret Service. Watching this loud mouth fat pig ego head right now on the Tele, just because nothing else to watch at this time period. I always look away when they do some type of close up on him and especially when he eats and turn the volume down. But, Obama must think he is "OFF THE HOOK"!